Those words can make the difference to someones day. Instead of going down the basement, these words can rocket a person to top level. A smile is born, and good vibrations are in the air. Will you have lunch with me? ……… And before you know it you are sitting on a roof terrace in Venice. The wind blows through your hair, the saltiness of the sea is on your tongue. The glass with bubbles reflects in your sunglasses as you look out over Canal Grande. It is time for lunch and you are ……… hungry. Intelligent as you are, you take care to keep the intake of carbs on the low side, so no dishes with pasta and bread. “Insalata verde nastro” is your choice, GREEN RIBBON SALAD ! Elegance on your plate. Pure simplicity of flavors, but so nice. Getting a little tipsy in the meanwhile, your bubbles pop as they leave your drink, and so does this little dream. Back on earth again, you have to get started to make this nice salad. Roast your almonds in a hot dry pan. Make nice ribbons of courgette with a potato peeler, wash and cut your tomatoes and cauliflower, and spring onions. 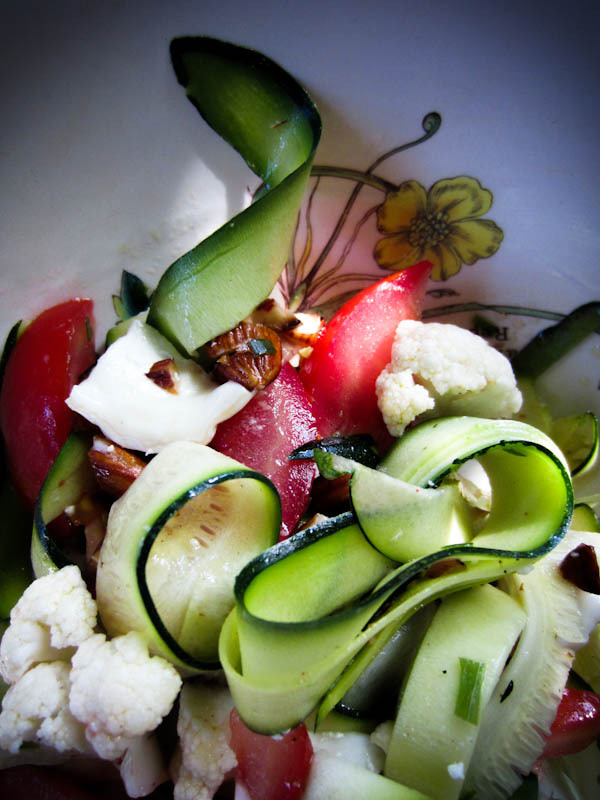 Choose your best “Italian” bowl, and assemble the vegetables with the cut almonds. The work is done ! Put on your sunglasses, if possible a glass of bubbles in your hand and enjoy. The wind in your hair, the sun on your face, your are back on the roof terrace again and looking out on Canal Grande.